Votes for Russia Iceland (5), Israel (3), Lithuania (10), Latvia (8), Estonia (4) , Malta (2), Greece (5). ORT once again hold internal preselection using well known principles. Result of it was officially announced in the beginning of April, though participation of the band was decided already in January, but management decided to make announcement at the time of the big solo concert of the band in Moscow. We are making internal selection with a help of a Jury. Who are the members of that Jury? Chief executives of ORT and specialists in show-business. Names? I won't give any. Why? No answer. What is the difference? There was real contest. 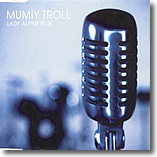 "Mumiy Troll" was selected from more than 2000 candidates. Among them "Gosti iz budushego", "Plazma", "Chugunniy skorohod" and other bands from Bashkortostan, Tatarstan, Komi Republic and other regions of Russia. They were sending their entries on everything possible: CDs, tapes and even bobbins, which we of course couldn't listen. But not single song of this 2000 was made public and bands "Gosti iz budushego" and "Plasma" even confirmed that they were not sending any entries for the contest. - We have never written any submision for their contest - tells member of "Plazma" Maksim Postelniy - Yes, there were some talks, but all of them strictly nonofficial. I knew that our material has reach ORT and there was slight possibility we can go. But no other information was given to us - who were candidates, when we got out of selection. I think that everyone knows how ORT is running their selection but nobody talks loudly about it. And of course their representatives who knows the real business will never say anything. Nobody even cared to reply to us that we will not be going anywhere. I only understood it when I heard from my unofficial sources that "Mumiy Troll" will be going to the Eurovision. I think we could turn things differently if we attached some money. But we don't have money. Especially such a sum required for Eurovision. This is very big amount only such big company as ORT or some big sponsors may be having. Possibly some sponsor decided that "Mumiy Troll"'s participation is better than participation of "Plasma". Let it be. We are not highly disappointed. We don't really think that Eurovision might help for European market promotion. That could be good promo action from Russian audience, but same money, that we or anyone else should pay for Eurovision, can be used here for same or even better scale promotion. Unofficial sources say that main sponsor of Mumiy Troll for the Eurovision was CD-Land company, distributor of official CD releases in Russia, created by Mumiy Troll producer Leonid Burlakov. At the live chat with the readers of Komsomolskaya Pravda, lead singer Ilya Lagutenko, as other ORT performers usually do, has claimed they go to Eurovision to bring win to Russia. Ilya Lagutenko "I'm pretty happy with this tour. We were never hoping for the win, simply because of that just appearing for 3 minutes we couldn't change Eurovision contest itself and to get influence on viewers and comissions of EBU, who are doing this event for 40 years. We are pretty satisfied with the performance itself, and even more with the time we had spent in Copenghagen. With some impression of political and format influences, there was atmosphere of real holiday, among participants and citizen of the city and guests from whole Europe. We had time to go sightseeing, and had big fun (every day we were jamming till the morning). And we had performed for the multimillion audience and reaction had followed immediately. Industry representatives were very surprised by high level and originality of our band (I was pretty touched by words that we are bringing unique music for the new Europe as a whole...). Cooperation suggestions followed immediately. And now we need to take rest from all this impressions. In the summer Mumiy Troll will start recording demos suggested by western record companies for possible debut European release next year. Also in the end of the year we will be going on promo-tour to Scandinavia and Germany. After Eurovision we were resting for two days... There was too much champaigne after the show. Eurovision has not affected our plans for the future at all. We know in advance, where we will go next, and that was just some nice addition to our development. To be part of this show is only a some sort of experience for us. May be I was telling different things in May, but now Eurovision is only pleasant memory. Official date of birth of the band is 16th of October 1983 when Ilya Lagutenko organized band originally called "Mumi Troll", which existed up to 1987. In the beginning of 90th Ilya is working in UK where in 1996 he records the new album of reborn band "Morskaya" and shoots some videos. After recording band returns to Russia and goes on touring through the country. Soon followed albums "Ikra", "Shamora" (which included best songs from first period of the band), "Tochno Rtut Aloe", another tour in Russia, concerts in Japan. 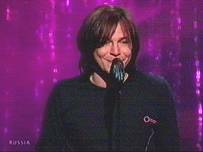 In February 2001 song for Eurovision Song Contest in Russian and English versions is recorded at CAN Studio in Germany. After Eurovision band continued issuing successful records and touring. Albums "Meamories", "Sliyaniya i Poglosheniya" were produced, soundtrack for the movie "Pohititeli Knig", tours in Scandinavia, Germany. Band has performed in a number of festivals and got some awards for best performances.